Twenty days after he was abducted, human rights activist Chief Mike Ozekhome (SAN) yesterday retuned into the warm embrace of his family and friends. The senior advocate, who said he will never forget his experience in the hands of his abductors, narrated his ordeal to journalists in his home in Lagos. Ozekhome, who had grown a beard, said he was driven on a rough road for about four hours to a jungle far removed from civilisation blindfolded, after he was captured close to Benin City about 3pm on August 23, 2013. According to Ozekhome, the abductors took him to an uncompleted building in the bush while a colony of mosquitos descended and fed on him and other hostages like barbeque in the camp. He also said that in the course of his abduction he took ill and was promptly attended to by the kidnappers' doctor who, after examining him, gave him injections and intravenous as part of his treatment for malaria and typhoid. According to him, from the moment of his abduction on August 23, he and 12 other victims were blindfolded by the gang in the camp. Ozekhome also said any time they wanted to speak to their abductors, they must face the ground, as looking at them (kidnappers) could hand the offender instant death sentence. 'Every 24 hours of the day, we had death sentence hanging on our head. When any of the kidnappers wanted to speak to us, we must face the wall or the ground. They treated me gently because they said they had discovered I'm on the side of the masses, that I have been fighting for the masses. Speaking further, he explained that his psychological and physical trauma was compounded when his son, Barrister Ilugbekhai and one of his juniors in chambers, Barrister Dominic Ezerioha, were lured and eventually detained with him in the camp. He described his abductors as highly organised and well educated, which, according to him, made it difficult for security operatives to track them down. He said: 'Even when making phone calls to the families of the victims, they travelled across four or five states so that where they make the calls was different from where their victims were kept. They discussed national issues with high intellect. 'They vowed that, in 2015, they will move against the politicians who they accused of being in the habit of using and dumping them. I asked them, what is the way out? They requested that the federal government should also grant them amnesty and that they are ready to lay down their arms if they are given amnesty just like the Niger Delta militants. Contrary to the general belief that the kidnappers usually conduct background information about their victims, Ozekhome said his abductors told him that they just operate randomly and that they don't profile anybody before they are captured. 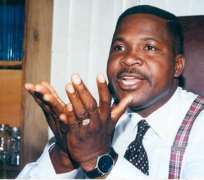 Moving forward, Ozekhome urged the federal government to declare a state of emergency on insecurity. According to him, a situation where none of us is safe on the road, in the air, on the water, in the day time or at night is a serious and monumental problem and we cannot continue to fold our hands. He linked the problem of insecurity fundamentally to the massive youth unemployment in the country which he described as complex and gargantuan. Consequently, he called on the government to declare a state of emergency on youth unemployment as any further delay may spell doom for the nation. He described youth unemployment as the father of Boko Haram, militancy, kidnapping and robbery. The senior advocate called on National Assembly to immediately amend the constitution to pave way for the establishment of state police. 'The argument against state police can no longer be justified in the face of grim security situation in the country. We should go through federalism as we had before the January 15, 1966, coup. In the United States, which is a true federal system, they have the FBI, the state police, and the city police. In fact, higher institutions there have their campus policing. He contended that the Nigerian nation can no longer pretend to be a united nation because Nigerians owe their allegiance to their various ethnic tribes first. His release sparked off jubilation in his home town of Iviukwe in Etsako East local government area of Edo State as family members, friends and sympathisers besieged his family compound in celebration. His elder brother, Chief Pius Ozekhome, in a telephone interview with LEADERSHIP in Benin yesterday expressed joy over the eventual release of his brother, describing the period their brother was held in captivity as one of 'horror' for the family members. He said Ozekhome was released to them about 7:45am when they received a call to go and pick him at a location in Edo, adding that ' I accompanied him to the airport in Benin where he boarded a flight to Lagos. He will address a world press conference'. Meanwhile, the traditional ruler of Udo community and an in-law to the Benin monarch, HRH Patrick Igbinidu, has been reportedly abducted by suspected kidnappers at his Udo kingdom. The traditional ruler (Iyasere of Udo) was allegedly kidnapped about 7pm by a four-man gang while playing draught with his friends close to his palace in the community and forcefully taken away to an unknown destination in an Audi car. Udo, a small community in Ovia South-West local government area of Edo State, is a significant community in Benin Kingdom, where all crown princes to the Benin throne must perform certain rituals before being crowned as Oba of Benin. Barrister Olayiwola Afolabi, while reacting yesterday, called on the federal government to immediately address growing rate of unemployment among youths and better funding of the Nigeria Police to effectively combat the upsurge of insecurity. 'Governor must invest from their security vote into security; you cannot fight crime without better policing and funding,' he added.